In line with modern transport systems across the world, MyCiTi provides a convenient way to travel. 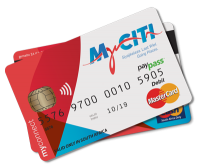 Every passenger needs their own myconnect card to travel with MyCiTi, except children under four years old and less than one metre tall, who travel free. This card-based fare system saves you the hassle of finding cash every day, cuts down on time queuing at the ticket kiosk and allows you to budget better by loading enough money in advance to travel for a week, month, or more. It is also in line with regulations of the national Department of Transport so that eventually these cards can be used interchangeably on transport systems across the country.